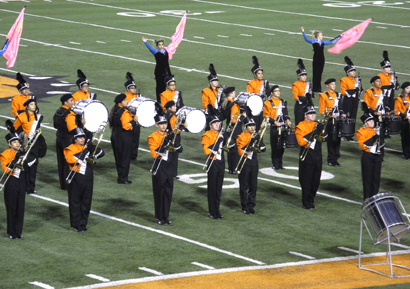 Members of the Artesia High School marching band perform “Rhythm Is Gonna Get You” by Gloria Estefan as part of their Latin-themed show Tuesday at the 54th Annual Southeast New Mexico Music Educators Association District Marching Festival at Bulldog Bowl. The Pride of the Pecos Valley was rated Division 1. Other bands in attendance included Class 6A Hobbs and Carlsbad, 5A Roswell, Goddard and Lovington, and 4A Portales, along with a grand finale of music from the Summer of Love by the Greyhound Sound band of Eastern New Mexico University.